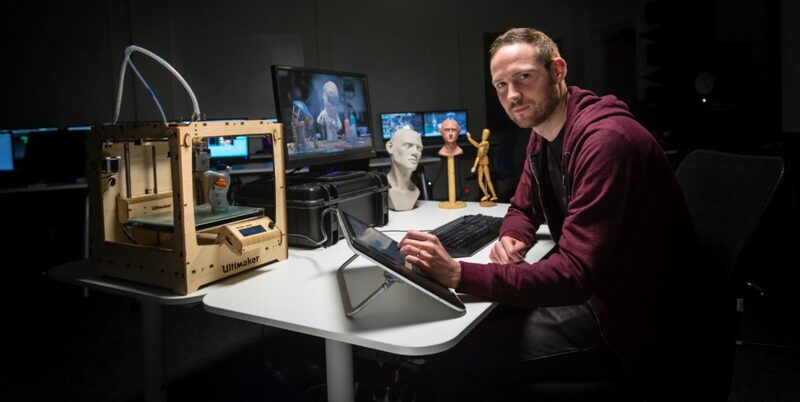 John O’Brien has been the senior animation lecturer here at Pulse since 2014. If you’re interested in a career in animation – you couldn’t have a more knowledgeable person to guide you. We recently sat down for a quick chat with John to learn more about his background, find out what exciting trends are taking place in the industry and what tips he has for animation students trying to land their dream job….. So, John, how did you find yourself teaching Animation here at Pulse College? Well originally my background is in game design. I studied game design in college and have completed qualifications to a master’s degree level. I also spent a while working in the area of mobile games, which is a fast-growing industry, constantly changing because the technology evolves so fast. I was always interested in the artistic side of things and soon found myself doing more 3D animation work – which I loved. When I was working, I was asked to do a bit of part-time teaching and found it very rewarding. It’s great to see students really getting to grips with a project and producing fantastic results. I suppose I got a bit of an itch and over time I moved full-time into teaching and here I am now – at Pulse College! Like quite a lot of our lecturers, I continue to work within the industry on a project by project basis and I also do freelance work in 3D animation. It’s a great way to keep in touch with the very latest trends and tech around. It also gives me an insight into what our students need to be learning in order to be useful to employers once they qualify. On top of that , there’s always the chance to refer students for positions or keep an eye out for job openings. Ireland’s renowned for having a thriving Animation Industry, what’s the latest? Yes, it’s fantastic to see the country doing so well and there’s absolutely loads of exciting things happening. One of the major bits of news is that Ireland is soon to have its 1st ever computer-generated 3D animation, feature-length film. It’s going to be fully produced here in Ireland by Boulder Media – an amazing Dublin-based animation company. We haven’t been given a title yet, it’s all quite hush hush but definitely…..watch this space! In fact, they’re actually advertising job openings for the feature on their site so go check them out…. Jam Media are another exciting company to watch, they produce fabulous work for the likes of the BBC, Nick, RTE to name a few. They also ran the Animation Dingle 2018 Festival, which brings some of the most respected industry professional together with students – to discuss all things animation! Any big trends to look out for this year? 3D is certainly something in vogue at the minute and we expect to see plenty more titles over the next few years in 3D. 2D has a very long and rich history but has levelled off a bit in recent times, although still very important to learn, from an educational point of view. The majority of work at the moment though is around 3D animation and 3D is used in so much media content now – advertising, cartoon series, films and even into new areas like medical simulation. The pharmaceutical industry is big in Ireland and continues to expand so the 3D animation experts are tapping into this new growing area. What’s driving the growth within Ireland? The government have incentivised the industry, some companies have managed to gain international recognition, and this has shined a light and the quality of work in Ireland. The likes of Brown Bag Films, Giant Animation and Boulder Media who I mentioned earlier have had huge success on a global scale and all have BAFTA nominations. Many of these companies started small and are now recognised on the international stage. The artistic flair and style that has been emerging from Ireland is attracting lots of business. Find out more about the booming industry…. There’s also the fact that while the animation industry in Ireland may not be as competitive as it would be within other countries – businesses here have collaborated successfully to win contracts. There’s a very vibrant community here. For example, a couple of years back two companies, Giant and Bolder, came together to work on a children’s animation show. They pitched as a joint venture to the BBC to produce Go Jetters. So, instead of trying to beat each other they pooled their talent and resources and won the contract. Companies often get together to work on projects and this has helped to win more contracts, secure grants and strengthen the industry as a whole. What are the key areas covered in the Animation Course? Our main focus on the animation courses is 3D animation, simply because that’s where the majority of jobs are. This is where we see our best chance for students to find employment. We also cover 2D animation, story boarding and sequential art and comic books. We’re one of the few animation degrees in the country that cover comic books. This is something that we’ve taken to an international stage – one of our lecturers, Eoin, runs a comic book publishing company (Lightning Strikes) and they have managed to secure the licence agreement to publish the 80th anniversary addition of The Phantom. Students were able to submit work for this project – which was a massive hit and sold in over 40 countries. Then we always look out for new trends, such as animation for medical/pharmaceutical companies, and we make sure students are aware of their options. While this isn’t a core element of the courses; it’s useful to keep students up to speed on potential areas of opportunity. What tips would you have for students trying to get into the industry? Students often ask, “what should my showreel be? what should my portfolio look like? what should be on my CV?” expecting there to be one magical version that would suit every job or every application – and that’s definitely not the case. As with every industry, you have to look at the job spec and really decide what the requirement is – what skills are they looking for and how can you demonstrate you have them. Then make sure that’s what you highlight in your application. Don’t bombard them with everything that’s in your portfolio or submit an overly long showreel. Often less is more. Target what you want to be, what you really want to do and what you love. Make that your goal and focus going forward. I wouldn’t suggest being a jack of all trades. The animation industry is big enough now that they are looking for specialists, people who can perform a specific job to as high a level as possible. We hope you enjoyed hearing from John – it’s certainly an exciting time for anyone who’s into animation. If you want to pop along to an open day and have a look at the facilities here at Pulse, we’d be happy to show you around.